This adventure started out on Christmas day when we began our annual trek north to Wisconsin to visit Kristine’s family and enjoy the winter wonderland of the northwoods of Wisconsin. For the past two years, I have left our house in the morning and biked north towards Wisconsin. About six hours later, Kristine has picked me up somewhere north of Cullman, and then we have finished the rest of the 18 hour drive overnight to arrive in Shell Lake by the next morning. This year, there was a major storm system moving in from the Gulf of Mexico promising lots of rain for Alabama and a huge blizzard for Indiana. We were racing this storm. Everything looked perfect for us to stick to our plan since the system wasn’t supposed to be arriving until later in the evening — at which point we would have already made it to Chicago. My ride started out great with over 3 hours of overcast skies and upper 30s lower 40s temp. Then shortly after discovering the Emerald Lakes climbs and making it to the bottom of Skyball Mountain, it started to pour down rain and thunderstorm. My Garmin cut off unexpectedly as my power meter died and the Garmin struggled to find a signal. I lost all of the data except for the first 15 miles of the ride. Sounds crazy, but I’m pretty sure that the source of the problem is when the power meter starts to give off goofy power meter readings, which confuses the Garmin and then causes it to crash. This has happened several times — all related to goofy (or missing) power meter readings. I’m pretty sure about that since I rode a long time in the rain yesterday but turned off the power meter on the Garmin, and the Garmin had no problems recording the entire 8 hour ride – so it’s not a problem with the Garmin and the rain. It’s a problem with bogus (or missing) power meter signal while the Garmin still is looking for a power meter. Anyway, back to the ride at Christmas, I ended up riding the rest of the way to Cullman (about 2 hours) including the climb up Skyball Mountain in the pouring down rain and temp in the upper 30s. I was freezing, but I rode really, really hard to stay warm. Then in the process of coordinating the pick-up with Kristine at First Baptist Church Cullman (heavily damaged by April 27th tornado) well short (30 miles) of our original pick-up spot, I stopped and waited for Kristine. It only took her a few minutes because she had earlier started to back track on the route. Those few minutes were enough to make me so cold that I couldn’t stop shivering until I had dried off, changed clothes, heater blasting in the car, and driving up to the original gas station in Falkville where we were supposed to meet. During this amazing awesome time of warming up, I tethered Kristine’s laptop to her phone and uploaded the ride to Strava discovering that all but the first 15 miles were lost. Initially, I was pretty upset — but then a few minutes later I resolved to do the ride again as an out/back ride from my house. The thought of that adventure was exciting enough to quash the sick feeling in my stomach of losing about 60 miles of data from an epic ride with new climbs and probably a few KOMs. Yesterday was the culmination, two and a half weeks after the original ride, of that excitement/anticipation. The weather forecast called for fog in the morning and slight chance of rain in the afternoon. Instead, it stayed heavy wet fog all day (misty light rain) and then rained hard by the end of the ride after sunset. Fortunately, I turned off my power meter on my Garmin so that the same problem wouldn’t happen again with the Garmin unexpectedly powering off and losing ride data. But that means I only have power meter data for the first hour or so of the ride, and the latter part of that data is bogus as the power meter starting giving off much too high power readings for the effort I was putting out. 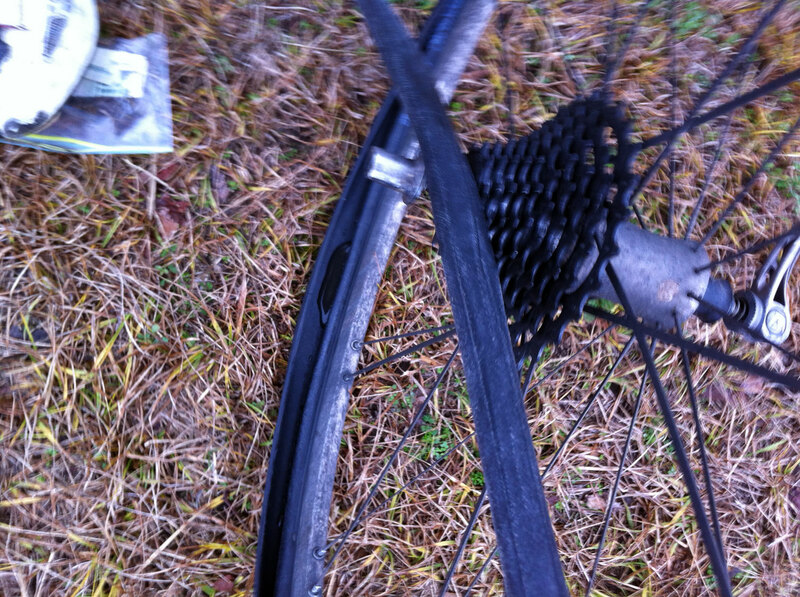 That is when I decided to turn the power meter off. Unfortunately, I had to keep a ziplock bag over the Garmin for most of the ride, which kills the total elevation gain as the Garmin is slower in responding to elevation change — which doesn’t make too much of a difference when you are crawling up a climb, but it does affect how it reads the descents … meaning that smaller hills get flattened because the Garmin never records the negative change before you’ve already started up (or completely finished) the next hill. There were two key things that I was anticipating on this ride: 1) the adventure of an out/back ride from Birmingham up and over Skyball 2) The emerald lakes climbs which I feel could be the steepest paved climbs in Alabama. The top video on this post is from that “steepest climb” on the return portion of the trip after climbing Skyball, changing a flat tire, and lots of other adventures about 95 miles into my ride. The next video below is the climb up the same ridge line near Emerald Lakes, but from the opposite side on the way out to Skyball. It also has some extended 20-25+% sections, but is more of a stair-stepper than the backside climb. Both videos are long, but if you click the “watch on youtube” button then you can click on the video bookmarks in the description to jump directly to interesting spots. The driest part of the ride was climbing up Skyball on the way out as the clouds had lifted a bit, but by the time I had turned around in the valley on the other side to climb back up, it had started to rain again. Here’s a short video heading down towards the Warrior river with a view of the skyball ridgeline. After climbing Skyball, I passed a hunter hunting from the roadside (I don’t think you’re supposed to do that). I also got a flat tire climbing back up Skyball Mountain, so I changed it at the top right next to the Tour de Cullman Skyball KOM finish line. The video below is me narrating the last part of the climb back up Skyball telling about my favorite Tour de Cullman finish (2011) and also discovering that I had a flat tire. Also, the two pictures are from the flat tire change. I spent a lot of time on changing the flat tire making sure I cleaned out all the debris that accumulated in the tire because I still had almost 70 miles left to get home. Fortunately, the single tire change held all the way home (although it had developed another slow leak so I had to change it again last night after I got home). I stopped at Locust Fork to refuel, and got two 20 oz Pepsi’s and one 32 oz gatorade for a total of $3.50. That was a LOT of liquid sugar for not too much money! I ended up with the nutritional equivalent of a perfect tweet – consuming that plus 7 powergels plus 3 cliff bars for a total of about 2300 calories during the ride arriving home without bonking and having eaten everything I had taken with me. Alabama won the football national championship on Monday. Here’s the headline on Wednesday at the gas station in Locust Fork where I stopped to refuel. Shortly after the Locust Fork stop, I turned around on AL-79 to head down to the Warrior River bridge to see if the climb from there to the top of Tucker Mountain would cross the Cat 3 threshold (it did). 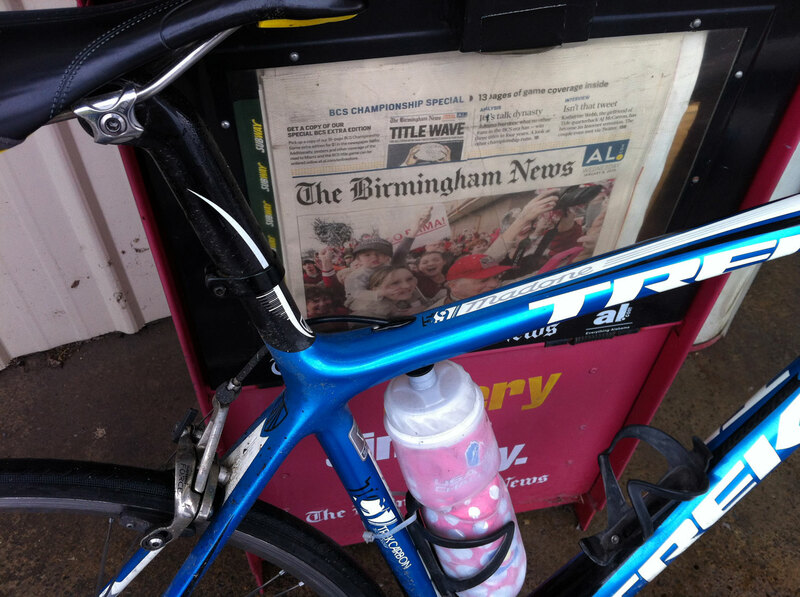 I also went hard to try to get the Tucker Mountain KOM (I did – but just barely – taking it from somebody named “No One” who had ridden from Huntsville to Birmingham … that ride was only 111 miles compared to my 135 mile out/back ride). 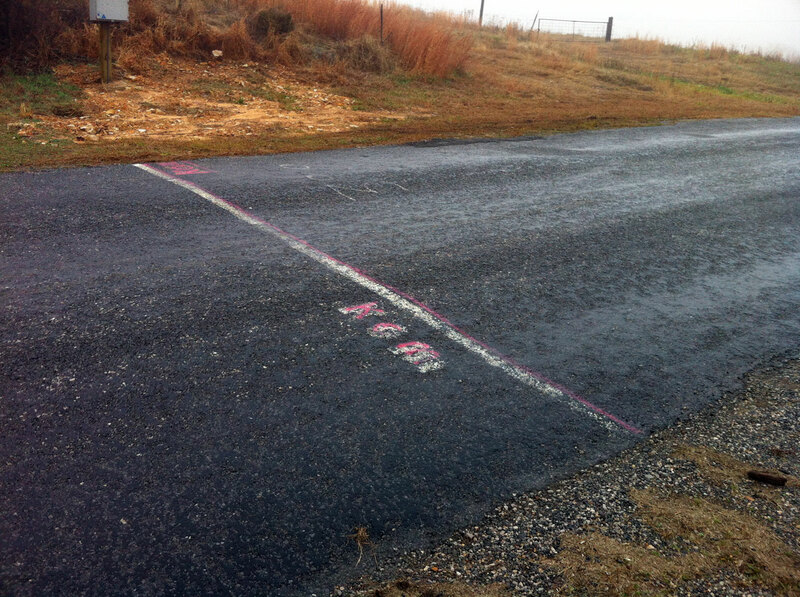 This entry was posted in Training and tagged climbing, epic, rain on January 11, 2013 by kartoone. Nice. Classic epic. Love you, crazy husband-of-mine.